Tiffany McDaniel is an Ohio native whose writing is inspired by the rolling hills and buckeye woods of the land she knows. Also a poet and artist, she is the winner of The Guardian's 2016 "Not-the-Booker Prize" for her debut novel, The Summer that Melted Everything. 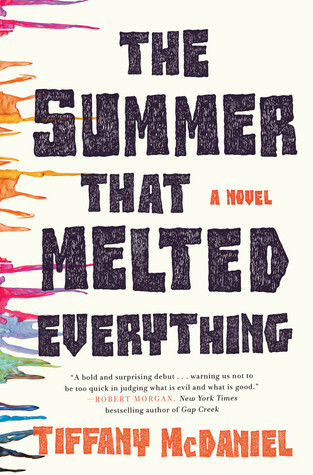 The novel was also a Goodreads Choice Award double nominee in both fiction and debut categories, is a current nominee for the Lillian Smith Book Award, and has recently been announced as a finalist for the Ohioana Literary Award and the Women's Fiction Writers Association Star Award for Outstanding Debut. While The Summer that Melted Everything is my first published novel, it’s actually my fifth or sixth novel written. I wrote my first novel when I was eighteen and wouldn’t get a publishing contract until I was twenty-nine for The Summer that Melted Everything. For me, it was an eleven-year journey to publication, full of lots of rejection and perseverance. I write literary fiction, and my stories can be quite dark. For this reason, I was always told I was risky to publish. But the struggle to get published has made me the author I am today. An author who knows the value of hard work and perseverance, and the value of each and every reader. Why did you choose to become a writer? Is it just a hobby or something else? I’ve been writing since I was a kid. It’s the first thing I remember doing as a child without being told to do so. It was an innate desire to write down what was in my head. I was born with story, as I think most writers are. We don’t choose to write. We need to write. We can only hope we are fortunate enough to make a career out of it. I always say I’m inspired by the characters themselves. They inspire me to write their truths, to the best of my ability. For the most part, authors will handle the bulk of marketing and publicizing a book, which means I’m in constant communication with reviewers and book bloggers. It’s part of my job as an author to read the review and continue the discussion with the reviewer. Sometimes the review is positive. Sometimes it’s negative. The thing is that you have to know when to step away and re-energize. The internet has changed the reviewing landscape. It’s 24/7 access to everyone with an opinion. In today’s age, your novel is rated and reviewed on a daily basis. It’s important not to allow all that noise to take hold of you because that frequency of being reviewed can take a toll, emotionally and creatively. It is easier said than done, because no matter how many positive reviews an author gets, it’s the negative reviews that linger in one’s mind. Where's your favorite place to write/read? I don’t have a favorite place to write, because unless you have the money to spend on the perfect writing nook, you really have to write wherever you can. Starting out I wrote on my bed because I didn’t have a desk. Now I write in the corner of my bedroom at a desk. I dream of a writing nook tucked away in a library one day, but the great thing about writing is that it doesn’t matter the place you do it at. All that matters is the story, for the story can take you anywhere. How many books did you write or published? What's your favorite book from the one you've written? I have eight completed novels, though The Summer that Melted Everything is my first published novel. It’s hard to say my favorite book because I love all the characters. I will say The Summer that Melted Everything was a joy to write. Even in its darkest moments, I never wanted to be away from this story, because being with the characters was one incredible journey. The novel I hope to publish next is that very first novel I wrote when I was eighteen. It’s been fourteen years since I wrote the novel. It feels like a good time to return to this story and to these characters. The title is, The Chaos We’ve Come From. It’s inspired by my mother’s coming of age in southern Ohio from the 1950s to the death of her father in the early 1970s. What's The Summer that Melted Everything all about? The Summer that Melted Everything is about a man who one day puts an invitation in the newspaper, inviting the devil to town. A boy, claiming to be the devil, answers the invitation, only this boy is not your stereotypical devil of red flesh and horns. This so-called devil’s arrival coincides with the start of a heat-wave that threatens to destroy the town’s very sanity. As the summer unfolds, the boy’s presence has tragic consequences on the town and everyone in it. Who is the real devil? That is a question The Summer that Melted Everything sets out to answer. Are you working on other books right now aside from this? I’m always writing. Currently I’m compiling my first poetry collection. I’ve been writing poetry since I was child, and it’s always nice to balance the poet in me with the novelist. What's your most favorite part of this book? One of my favorite parts is the scene in which Fielding meets Sal for the first time. Fielding is the son of the man who invites the devil. And Sal is the one who claims to be the devil. This first meeting of the two is one of my favorite scenes because in many ways it’s just two boys meeting for the first time on a summer day. I will say that 1984 was a year that understood how to make history. Apple launched its Macintosh computer for the masses, two astronauts walked the stars like gods, and singer Marvin Gaye, who sang about how sweet it was to be loved, was shot through the heart and killed by his father. In May of that year, a group of scientists published their research in a scientific journal, revealing how they had isolated and identified a retrovirus that would come to be called HIV. They confidently concluded in their papers that HIV was responsible for the acquired immune deficiency syndrome. AIDS, as the nightmares say. Yes, 1984 was a year about news. It was the year Michael Jackson would burn for Pepsi, and the Bubble Boy of Houston, Texas, would come out of his plastic prison, be touched by his mother for the very first time, and moments later die at just twelve years of age. Overall, the 1980s would prove industrious years for the devil. It was a time you couldn’t just quit the horns. Satanic cult hysteria was at its height, and it stood tall. Fear was a square that decade so it could fit into our homes better, into our neat little four-cornered lives. If a carton of milk turned over, the devil did it. If a kid showed bruises, he’d be put in therapy immediately to confess how his own parents had molested him around a bonfire while wearing black robes. Look no further than the McMartin Preschool investigation, which started in ’84 and ended with fantastical allegations of children being flushed down toilets and abused by Chuck Norris. While these allegations eventually would be flushed down the toilet themselves, that time of panic would always be remembered as the moment when the bright, bright stars could not save the dark, dark sky. Breathed’s own devil would come differently. The man who invited him was my father, Autopsy Bliss. Autopsy is an acutely strange name for a man to have, but his mother was an acutely strange woman. Even more, she was an acutely strange religious woman who used the Bible as a stethoscope to hear the pulse of the devil in the world around her. The sounds could be anything: The wind knocking over a tin can. The clicking of rain on the windowpane. The erratic heartbeat of a jogger passing by. Sometimes the things we believe we hear are really just our own shifting needs. Grandmother needed to hear the spook of the snake so she could better believe it actually existed. She was a determined woman who pickled lemons, knew her way around a tool box, and raised a son by herself, all while earning a degree in ancient studies. She had the ancients in mind when she named her son. After the summer ended, I asked my father why he had invited the devil. Growing up, my father was the wood in his mother’s lathe, held in place and carefully shaped over the years by her faith. When he was thirteen, his edges nearly smoothed, the lathe suddenly stopped turning, all because his mother slipped on the linoleum floor in their kitchen and fell backward with no parachute. The bruises would come to look like pale plums on her flesh. And while not one bone had been broken, a spiritual break did occur. As Dad helped her to her feet, she let go of a moan she’d been holding. Then, in a giddy woe, she dropped her knees back to the linoleum. “He wasn’t there,” she cried. “Who wasn’t there?” Dad asked, her shaking contagious to him. She took the crucifixes off the walls, buried her Bible in the infant section of the cemetery, and never again poured her knees down to the ground in prayer. Her faith was a sudden and complete loss. Dad still had the fumes of his faith left, and in those fumes, he found himself one day walking into the courthouse, where his mother was getting reprimanded by the judge for unabashedly vandalizing the church—the second time. While Dad waited outside her courtroom, he heard voices a few doors down. He went in and sat through the trial of a man accused of pulling out a shotgun at the coin laundry, leaving bloodstains that couldn’t be washed out. To Dad that man was the devil emerged and the courtroom was God’s filter removing that emergence from society. As he stood there, Dad could see tiny breaks in the courtroom wall. The holes of a net through which a bright, warm light shone, pure and glorious. It was a light that made him want to stand and shout Amen until he was hoarse. While his soul had before paced back and forth from doubt to belief, on that day in the courtroom, his soul settled on believing. If not in everything else, then at least in that filter, that instrument of purity. And the handler of that filter, in Dad’s eyes, the person who made sure everything went the very best of ways, was the prosecutor. The one responsible for making sure the devils of the world are trapped by the filter. Dad sat there in the courtroom, hands shaking, his feet swinging just above the floor they were too short to reach. When the guilty verdict came, he joined in the applause as he smelled a whiff of bleach that he associated not with the janitor in the hallway but rather with the filth trapped by the filter and the world being cleaner for it. The courtroom emptied until only Dad and the prosecutor remained. Dad sat on the bench, wide-eyed and waiting. “So you are who I heard.” The prosecutor’s voice was like a pristine preaching to Dad. “How could you have heard me, sir?” Dad asked in pure awe. That was the moment Dad knew he himself would become a handler of the filter. And while his mother never regained her faith, he kept his in the courtroom and in the trials of humanity and, most important, in that filter. They said he was one of the best prosecuting attorneys the state had ever seen. Yet there was something unsettled about my father. Handling the filter did not prove to be an exact science. Many times after winning a case, he would escape from the applause and congratulatory pats on the back to come home and sit quietly with his eyes squinted. That was how you knew he was thinking. Squinted eyes, arms folded, legs crossed. It was on one such night that he uncrossed his legs, unfolded his arms, and widened his eyes, in that order. Then he stood, rather certain as he grabbed a pen and a piece of paper. He began to write what would end up being an invitation to the devil. It was the first day of summer when that invitation was published in our town’s newspaper, The Breathanian. We were eating breakfast, and Mom had laid the paper in the middle of the table. With morning milk dribbling down our chins, we stared at the invitation, which had made the front page. Mom told Dad he was too audacious for his own good. She was right. Even the atheists had to admit it took a fearless man to audition the existence of the Prince of Darkness. I still have that invitation around here somewhere. Everything seems so piled up nowadays. Hills all around me, from the soft mounds of laundry to the dishes in the sink. The trash pile is already waisthigh. I walk through these fields of empty frozen dinner trays and beer bottles the way I used to walk through fields of tall grass and wildflowers. An old man living alone is no keeper of elegance. The outside world is no help. I keep getting these coupons for hearing aids. They send them in gray envelopes that pile like storm clouds on my table. Thunder, thunder, boom, boom, and there the invitation is under it all, like a bolt of lightning from the sky. I never thought we’d get an answer to that invitation. At the time, I wasn’t even sure I believed in God or His antonym. If I had come upon a yard sale selling what was purported to be the true Veil of Veronica beside a bent Hula-Hoop, well, I was the type of boy who would have bought the Hula-Hoop, even if the veil was free. If the devil was going to come, I expected to see the myth of him. A demon with an asphalt shine. He’d be fury. A chill. A bad cough. Cujo at the car window, a ticket at the Creepshow booth, a leap into the depth of night. I imagined him with reptilian skin in a suit whose burning lapel set off fire alarms. His fingernails sharp as shark teeth and cannibals in ten different ways. Snakes on him like tar. Flies buzzing around him like an odd sense of humor. There would be hooves, horns, pitchforks. Maybe a goatee. This is what I thought he’d be. A spectacular fright. I was wrong. I had made the mistake of hearing the word devil and immediately imagined horns. But did you know that in Wisconsin, there is a lake, a wondrous lake, called Devil? In Wyoming, there is a magnificent intrusion of rock named after the same. There is even a most spectacular breed of praying mantis known as Devil’s Flower. And a flower, in the genus Crocosmia, known simply as Lucifer. Why, upon hearing the word devil, did I just imagine the monster? Why did I fail to see a lake? A flower growing by that lake? A mantis praying on the very top of a rock?